The high level of crime affects everyone in South Africa. It is not only the victims of crime who suffer, but also the good name of our country. This is why everyone, from individuals and communities to businesses, must join hands to fight crime. Government's anti-crime campaign wants all sectors of society to form partnerships with government and law enforcement agencies to help make our country safer. Many partnerships have already been formed. These include the Anti-Crime Leadership Forum, Business Against Crime, Take Charge, Bambanani, and Primedia Crime Stop. Ordinary people are encouraged to join the fight against crime by joining Community Police Forums, becoming police reservists, starting neighbourhood or street committees, or working as volunteers at their local police stations. Members of the public are also encouraged to report crime at all times and to avoid buying stolen goods. Remember, if you buy stolen goods, you help to create a market for such goods. As part of the anti-crime campaign, government also talks to different organisations about ways to keep our communities safe. Many of these organisations have already joined the fight against crime. They include Community Police Forums, faith-based organisations, organised labour and non-governmental organisations. The International Marketing Council, for example, plans to start an Active Citizen campaign. The campaign will encourage citizens to stand together, to reach out and strengthen good values in our society. 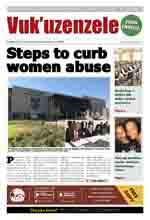 Last year, the Gauteng provincial Department of Community Safety started a crime prevention plan called Take Charge. The plan includes programmes like strengthening communitypolicing structures throughout the province. The plan also aims to teach the public how their partnership with the police can help reduce crime. It aims to unite all communities from all backgrounds across Gauteng to help fight crime in their areas. The theme for the campaign is "Take charge, because crime stops with me." If everyone in the country follows this advice, we can all help to stop crime and build a safer and more secure South Africa.